Reward your customers and keep ‘em coming back for more! Loyera is an intuitive, efficient, and easy loyalty software that helps you build and manage a community of loyal customers. We help you manage returning customers, attract new ones and track every single activity of your loyalty program. Download the Loyera Merchant App from the iOS or Android app store and register your business instantly. Set up your business on Loyera and configure loyalty offerings. Invite your customers to be a part of your loyalty program through social media platforms or connect them to your network when they visit your store. Set reward points for every sale to be redeemed later by customers, and manage a community of loyal and regular customers effortlessly. Develop a loyal and trustworthy relationship with your customers, which will help you grow your business and expand your customer base. Loyera offers a host of unique and practical advantages to its users. Loyera is based on the cloud and is simple, efficient and easy-to-use. Instant registration, quick setup and immediate roll-out of your rewards program. Set up rewards, track customer purchases, manage staff contributions, and offer a seamless rewards redemption experience to your loyal customers. Offer rewards to make customers visit more frequently. Convert recurring customers into regular ones by offering them discounts on their favorite products. Have a potentially unlimited access to new customers in your area on the Loyera network. Woo new customers with irresistible deals and offers. Attract customers, new and regular, by offering customized and exclusive deals unique to your location by using the Loyera app. Maximize sales by tapping into your neighborhood. Increase visibility, expand your business and witness a surge in your customers with Loyera. Get Loyera and supercharge your business NOW. 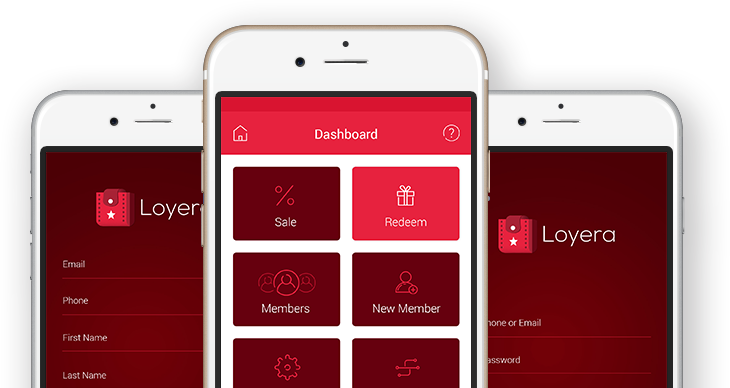 Loyera is an intuitive, efficient and easy customer loyalty management software that helps you to build and manage a community of loyal customers.